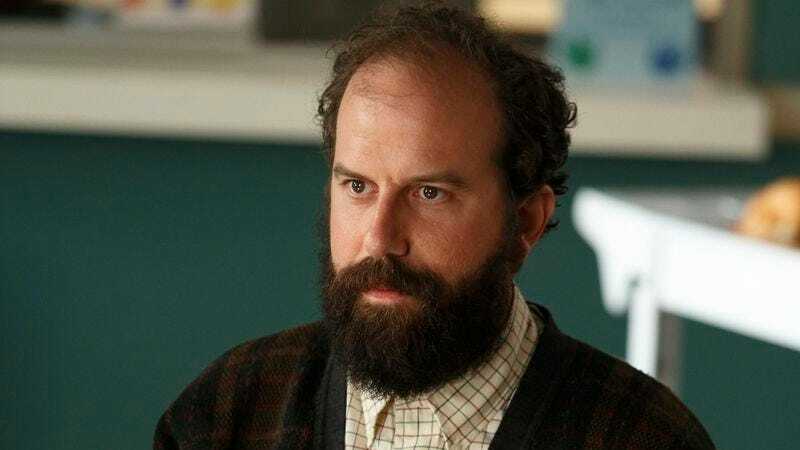 On his Earwolf Media podcast, Gelmania, Brett Gelman’s catchphrase/mantra is, “I’m not doing well.” That couldn’t be less true of the comedic actor’s 2012: He’s doing quite well professionally, co-starring in the second season of Adult Swim’s Eagleheart and earning regular roles on a pair of new fall premières, MTV’s adaptation of The Inbetweeners and the NBC sitcom Go On. Gelman’s role as Mr. K on Go On is particularly attuned to the unhinged persona the performer has honed on the stage of the Upright Citizens Brigade Theatre and in his many turns as the thorn in the side of Comedy Bang! Bang! host Scott Aukerman. As Mr. K, Gelman is both unsettling and vulnerable, and frequently the funniest member in a therapy group whose ranks also include Matthew Perry, Tyler James Williams, and Julie White, among others. During the Television Critics Association Summer Press Tour in Los Angeles, The A.V. Club spoke to Gelman about playing “a positive Hannibal Lecter,” how the experience of making a television series mirrors group therapy, and why he doesn’t believe in the divide between so-called “alternative” and “mainstream” comedy scenes. The A.V. Club: Go On has a huge cast. How do you make your presence felt on set? Brett Gelman: The writers have done a really amazing job at making all the characters very different from each other. Since the characters all have some emotional issues, they’re going to group therapy, that really accentuates it. When you say your thing, it really punches through. They are doing a very good job of giving everybody their moments. AVC: So a lot of the eccentricity of Mr. K was already on the page when you came to the role? BG: I think so. I’m sure that somebody else would have done it differently, but they’ve let me do some things with him. And of course, they were down with my characterization of him, but to me that was what was on the page. The writing is so good I’m not having to make things up and concoct things to say. BG: I got asked to do this role. [Creator] Scott [Silveri] knew me. I think Scott was a fan of The Other Guys. He was like, “Oh, Gelman’s a good ‘total weirdo.’” [Laughs.] “We’ll get him to play one of the weirdest characters in the show, if not the weirdest.” And I love it. I love playing this crazy guy. AVC: You steal the scene so often in the pilot, and just with the tiniest stuff, too. You don’t have many lines, just a lot of staring, a lot of silence. BG: Right, he’s like a positive Hannibal Lecter—a Hannibal Lecter who would never hurt anybody. The interplay between all of us is already so strong, I think things really jump out as people react to it, even if it is just a close-up. We’re all there supporting each other off-camera during each other’s coverage in playing the scene out, and I think that really helps people commit to those moments—especially Matthew [Perry], nobody’s better at reacting to insanity than Matthew. A crazy action only works if there’s a great reaction. AVC: You’re going to be two peas in a pod. AVC: So much about the character is enigmatic: For instance, he’s the only person in the group who doesn’t come out and say why here’s there. Is that a challenge, approaching a character with a mysterious past? BG: It’s fun. It’s fun to create that past. And, also, the writers are creating that past. We have talked extensively about what his life was before he came to this group and what it is outside of this group. That’s really fun to do. It exists, but I think it will unfold more as this series goes on. You’ll find out more about Mr. K. There’s a lot of secrets, none of which are particularly dark. AVC: Anything specific that you can mention? BG: I can’t. I can’t. He’s the Lost of the show. There’s going to be a whole viewing audience that’s just going to want to know the secrets of Mr. K. Just kidding. AVC: Does he have a big, complicated mythology? Is he the smoke monster? BG: He’s the smoke monster, exactly. [Laughs.] Mr. K is the smoke monster of Go On. It’s perfect. AVC: In light of the show’s deeper, emotional content, do you see Mr. K as the purest expression of comic relief on Go On? BG: No, I think that, as it is in the pilot, he is providing a lot of the relief for them. I know the character will continue to, but I do think it’s important, and what I think is so great about all the writing and all the actors is that everybody’s approaching the comedy from a very real place. Whether it’s the more moving elements of the show or the comedy, it’s all being approached from the same place, what these characters need from each other. Even when I’m asking Seth Morris if the man his wife slept with “was by any chance black,” there’s still a real need there. But I think that the shorter and less pretentious answer is that yeah, he provides a lot of comic relief within the moving elements of the show. BG: It’s the best. I’ve known Seth for 13 years. We were doing shows at UCB in the late ’90s. So that’s pretty insane to be on a show with him and be going to work with him every day. You really feel that support from everybody. It almost feels too good, the camaraderie between the cast and then the writers. We all feel close already. There’s never any weird competition or people feeling strange about somebody else having a funnier moment than them. If something is funny, everybody just loves it. AVC: It must help that life is sort of imitating art—both the cast and the characters are working through a process together. BG: Exactly. On the show, they’re going through loss. We as a group are going through the trials and tribulations of show business. [Laughs.] Which is just so hard. So hard. AVC: Talk a little bit about your hard showbiz life. BG: Oh my God. We’re here at the Beverly Hilton, and you know, I would have preferred organic coffee. I don’t know if this is organic or not. I should have checked into that. AVC: It’s not free-trade. You need to know where the beans came from. BG: It’s a hard life being on a network show. Matthew is very much like our big brother. He really takes care of the whole cast. So often big stars like that would be threatened by other people being funny. He wants everybody to be at their best. He wants it to be a true ensemble, which is cool. Should I be funnier? I’m not being very funny in this interview. AVC: It’s fine to be both funny and to get down into the weeds—it’s what The A.V. Club does. BG: They love it. Those readers love it. All of us comedy nerds love to get real deep and analytical about the comedy. I’m sorry. Want to hear a joke? AVC: The refrain of the Gelmania podcast is, “I’m not doing well.” Do you see that as running parallel to the themes of Go On? AVC: Work is work. Being funny wherever you can, taking any opportunity that presents itself. BG: Exactly. Never turning it off, never being a real person. [Laughs.] Keeping the reality of your work and keeping it out of your life so that you don’t kill yourself. AVC: You got a little Brody Stevens-esque there. BG: I’m the positive Brody Stevens. I love Brody Stevens. He’s one of my favorite stand-ups. I love Brody. You love Brody too right? [Affecting a Stevens-like voice.] Positive energy. Is that ripping him off? I might rip off Brody sometimes. If I do, you’ve got to call me out on that and tell me that I am. AVC: Well, that’s like the basis of your “cadence thief” bit. Your style of talking onstage, that cadence, is a common thing in comedy right now. BG: The Brody cadence or people assigning a cadence to them? AVC: People assigning a cadence to themselves and finding that weird strain of motivational speaking that finds its way into a lot of live comedy. AVC: But comedy can still be healing. AVC: The readers will love it. They’ll eat it up. BG: Will they? Or will they be like, “C’mon man. You’re a comedian. You tell stupid jokes and play stupid characters.” No, but I have to go this deep in order to serve my audience. [Laughs.] Oh wow, even more pretentious. I’m really grateful for everything, to be a part of the show. The show is about healing, and I think that’s a really important thing that people need to aggressively do right now in the world. It’s really what people have always had to do, because the world’s never been okay. Now it’s natural disasters. In the ’80s it was nuclear war. It’s different but the same. I think it’s a great thing to be on a show about people facing the problems in their life and coming together with other people to help get them through that in a really funny way. AVC: And it takes a unique perspective among current TV comedy, mixing the comedy with emotional beats and characters looking to heal. BG: I think it will hopefully make these events that happen to us kind of less of a bummer for people. Loss is a part of life, unfortunately, and you’ve got to just deal with it. It’s a self-important thing, but in some small way, hopefully somebody who is going through something hard — which, there are a lot of people going through things. I forgot how to speak. AVC: It’s because your cadence was stolen.